Moisture Infuser. 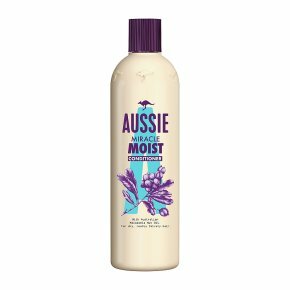 Aussie Conditioner Miracle Moist special formula, with Australian Macadamia Nut Oil, helps condition and smooth hair. Bad hair days will be a dark, distant memory, and not answering the door because you haven't done your hair will be a thing of the past. Native to the land down under, the Macadamia nut is rich in oils, and has been used in Australia for centuries. And it would have stayed their little secret if it hadn't been for, an intrepid 19th century explorer who schlepped half way across the world and brought it back for the rest of us. What a guy. Our miraculous formula leaves parched hair intensely conditioned. It helps infuse moisture into parched hair. With Australian Macadamia Nut Oil. For dry, really thirsty hair.Thirsty hair crying out for a miracle? Look no further! Our miraculous conditioner, with Australian Macadamia Nut Oil, helps infuse moisture into parched hair. The Macadamia nut has been used for centuries down under for its moisturising properties. And it would have stayed their little secret if it hadn't been for a 19th century explorer who schlepped across continents to bring it back for the rest of us. What a guy!